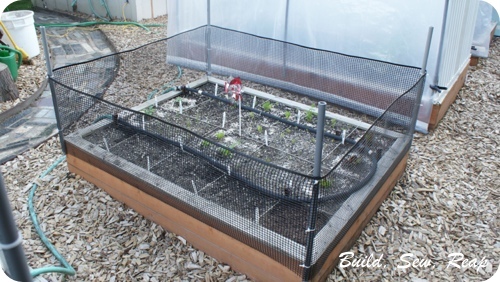 I feel like we have a lot of pests threatening our garden but they might not be the kinds you have to deal with. Just in case they are, here are my solutions. 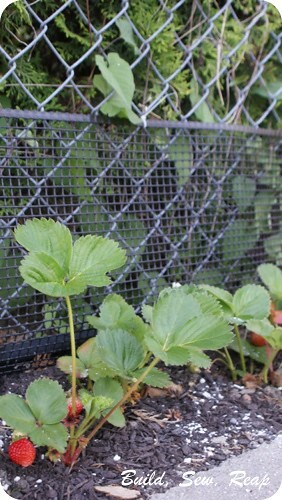 Our neighbors have chickens and they apparently LOVE strawberry plants so I had to add some hardware cloth all along the chain link fence between our properties to keep their little beaks from clearing out our harvest before they could even develop. I was pretty proud of myself for catching that problem before they got any actual strawberries (they hadn't started growing yet). That was a pretty easy solution. 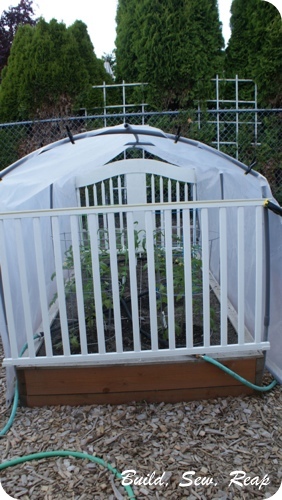 I bought a 3' by 15' roll of black plastic hardware cloth, cut it down in 12 inch (by 15') strips and used zip ties to attach it to the chain link fence that was already there. No more attack chickens. Again, this was a preemptive move but I didn't want the local birds to eat all our strawberries. 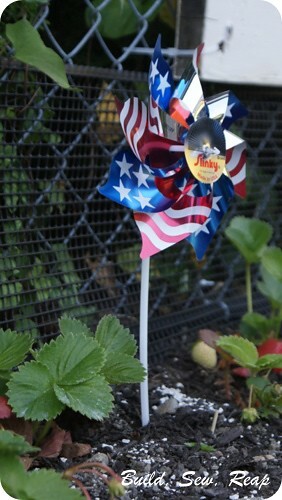 I also don't want to spray our strawberries with anything, nor did I want to try to cover them with expensive bird netting so we picked up a bunch of pinwheels. I've read that birds hate mirrors and shiny things so this seemed like a fun solution. We stuck one every 4-5 feet in the strawberry bed. They aren't all patriotic but the Snickerdoodle insisted we get some "Merican Flag" pinwheels and they were shiny so we both got what we wanted. I sprinkled crushed oyster shells all throughout my beds. I guess they hate crawling across the jagged pieces and will head elsewhere. 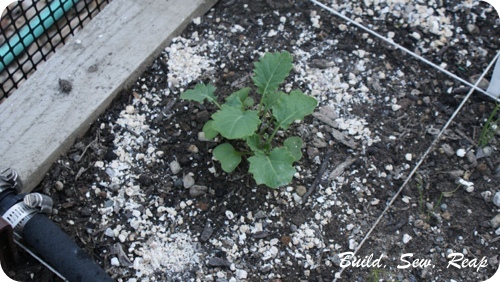 They have no affect on the soil, are 100% organic and you only have to put new stuff down if you disturb the soil. Seems like a great solution to me! I found foot prints in my salad bed the other day. I inspected the soil for animal poop and didn't see anything that looked suspicious but you better believe I wanted to get a little fence up around this bed before someone did decide to use it as a bathroom. I appreciate the outdoor cats in our neighborhood because I have no doubt they're doing a great job of keeping the rodent population in check but I don't want them cutting through my veggies. A few scrap pieces of PVC pipe and some more of that awesome plastic hardware cloth and my bed is now protected. A couple of weeks ago, I was out gardening with the little one following me around. He's only 17 months so curiosity gets the best of him pretty regularly. I was transplanting some corn out of one bed and into another when I turned around and saw him standing there with a healthy corn plant in his little fist with the roots dangling nowhere near the bed. Thankfully I was able to get it back in the soil without any lasting damage but I've been watching him pretty carefully ever since that. Today I was digging out a piece of scrap wood in the shed when I saw an old crib I had in my wood storage that's been waiting for a purpose for several years. 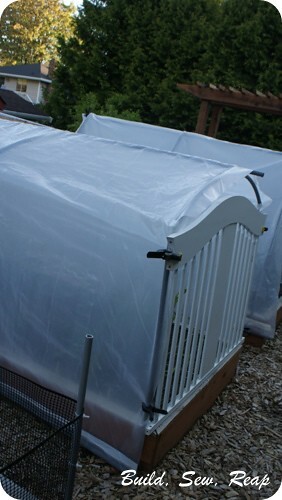 I just used big clamps to clip it to the PVC frame over my plants but I might end up using zip ties or maybe even screwing them in to the bed if I find I don't need to move them. I love how cozy this garden bed looks now with a headboard and a footboard. I also love that the little dude probably won't be able to pull up any plants but if he tries to reach through, I'm not afraid to staple some hardware cloth or screen to the slats to keep him out completely. Do you recognize that shape? That's half of the 8-foot mustache we attached to the front of the house for Mr. Mischief's 1st birthday party. I painted it with some left over chalkboard paint and we hung it above the strawberries. It keeps the neighbor's trees from growing through and serves as a pretty great sign. Wow! What a garden! Love that you are so proactive. 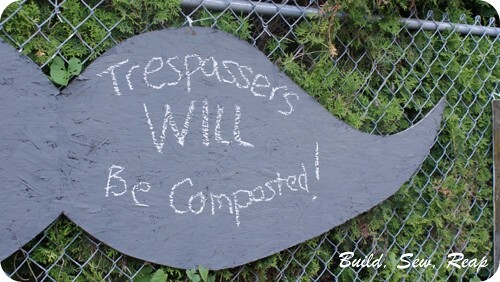 Great tip about slugs and oyster shells...and I love the pinwheels and trespassing sign, too. Happy gardening!